CPAIMeals Not Mentioned In The Itinerary. After morning breakfast drive to Munnar enroute visit Cheyyappara Water Falls. Overnight at hotel. Munnar Today after morning breakfast full day city tour of Munnar including visit the tea plantations, Tea Museum, the Eravikulam National park home of the endangered Niligiri Thar (Ibex), followed by visit to the Mattupetty dam, the the Kundala Lake and other scenic spots.Overnight at Hotel in Munnar. Today morning transfer to Thekkady has one of the worlds most fascinating natural wildlife reserves noted for its geography, diverse wildlife and scenic beauty. In the afternoon at 1300 Hrs arrive at Thekkady and check-in at Hotel. In the Evening at about 1530Hrs go for a boat ride on the Lake Periyar (own arrangement) where one can have a unique experience of viewing wildlife at close quarters from the safety of a boat on the lake. The greatest attraction of Periyar, however are the herds of wild elephants that come down to play in the lake (Wild life viewing is always dependent on one’s good fortune).Overnight at Hotel in Thekkady. 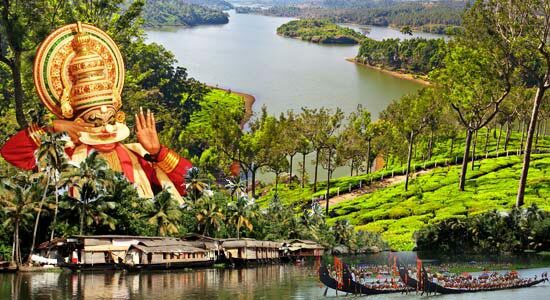 Today after morning breakfast drive to Alleppey upon arrival check in your hotel, evening city tour for Alleppey around. Overnight at hotel. Today after morning breakfast drive to Kovalam upon arrival check in your hotel. Overnight at hotel. Day excursion trip to Kanyakumari including visit to Kumari Amman Temple - The temple is devoted to the Goddess Parvathi as Devi Kanya- the Virgin Goddess, Vivekananda Memorial - The Vivekananda Memorial has been built on the Vivekananda Rock and is devoted to Swami Vivekananda, Gandhi Mandapam - This memorial stands on the place where the the ashes of Mahatma Gandhi was kept for public viewing before being immersed into the sea and other place . Overnight at hotel.